Crimestoppers, along with a number of community groups came up with the idea of a community trailer that could be used by the community to help trail bike riders access the Cambridge Motocross Track. On the 1st of June this year there was a handover of the trailer at the official Crimestoppers Week function. Their CEO, Ron Franks had this to say . 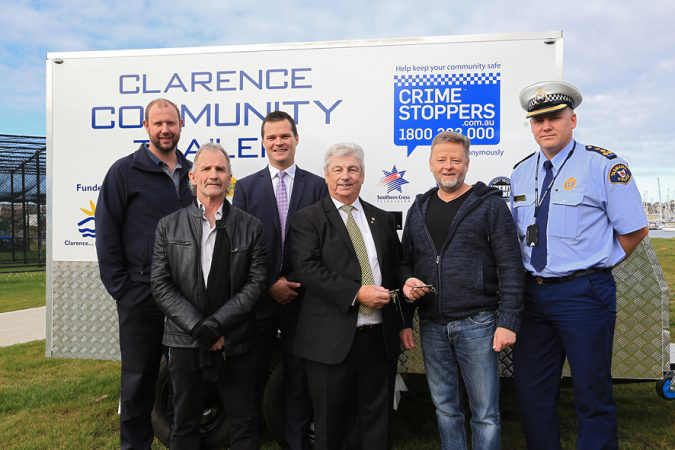 . .
“Over the past three years, Crime Stoppers Tasmania has gone from strength-to-strength having rolled out numerous community-based projects. Today’s wrap up event included launching the new Clarence Community trailer, which has been built by Rosny College students and supported by many Tasmanian businesses and community groups. The trailer is available for use by community groups throughout Clarence and interested parties can contact Dermot on the form below to organise use of the trailer. There is an insurance form that needs to be completed before the trailer can be used so make sure you give yourself plenty of time to get the form in before you’re scheduled to pick the trailer up. Download the Insurance PDF form, fill in your details and upload with your enquiry.